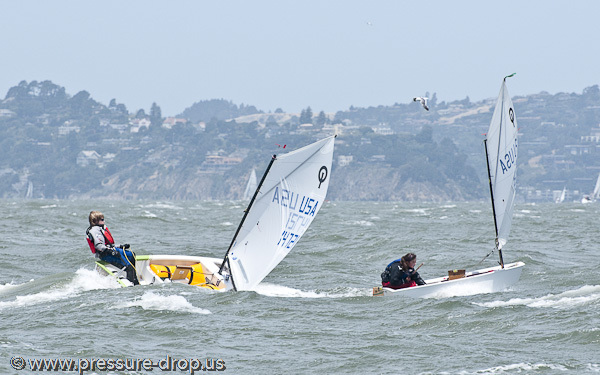 In yet another example of racing when the most recent crop of America’s Cup boats would be huddled ashore, youngsters from up and down the West Coast spent last weekend sailing the Opti Heavy Weather regatta on the San Francisco cityfront. This is one place where locals can give an event a name like that, and proceed with reasonable confidence. The scene on Saturday, through the lens of Eric Simonson . . .
What would it take for a half dozen Daisy Scouts to raise $545 in 45 minutes in a shopping center in a suburb north of San Francisco? Truth to tell, though, Lucy’s parents, Jennifer and Jeff, were a feeling a little sheepish. 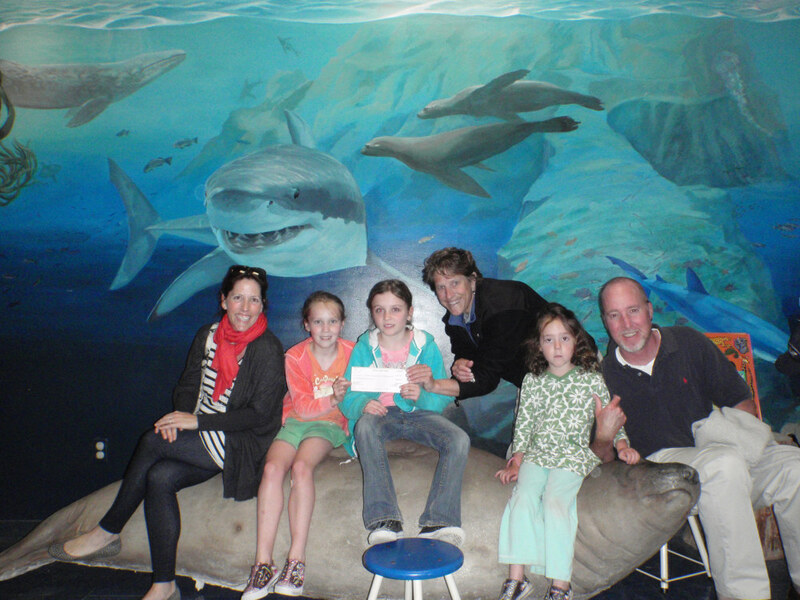 That $545 fundraiser followed the Cosco Busan oil spill on San Francisco Bay. Oops. Almost three years ago. Slow delivery (but, mom and dad, I sympathize). So we ask, in the hectic pace of modern life, what does it take to get grownups moving? The answer, apparently, is another oil spill. Winds in the twenties and thirties is not super-rough, but it’s more than enough to get your attention when you’re beating upwind or close reaching on the ocean on a modest-sized keelboat, and there were victims in the early going in the Singlehanded Transpacific Race that left San Francisco Bay on Saturday. Electricals and communications were the failure thread. Ben Mewes found that he wasn’t getting a battery charge out of the solar panel on Mirage and returned to switch out the batteries and tweak the panel installation. Then he set out again late Sunday night. Sam Burns (Catalina 309, Southernaire) delayed his departure to work around some issues with a SSB and rent a sat phone for position reports. He too got away on Sunday. Reducing the total fleet to 14, however, Al Germain on Bandicoothe had led the fleet out the Gatepacked it in after his sat phone and SSB got salt water-soaked out of commission. Ronnie Simpson on Warrior’s Wish as of Monday afternoon was farther out the track than his competitors, but he is also the boat farthest north. Usually, that becomes a vulnerable position before a race to Hawaii is over. Winning strategy is all about picking your lane as you enter the Trades, and they’re a ways short of that as yet. “For two hours there was 34 kts sustaining with gusts to 38. The seas were above my second spreader! I have to admit for those two hours I wished I were somewhere else. Better now. “One of the blades of the wind generator ripped off. Gone. Well, there goes that power source, I will bring a spare set next time. “I have all this great food but I really have not eaten yet, just one apple and some jerky. I’ll try to force some food down today. “A tanker crossed my path last night when I was asleep. I called him up on VHF and asked if he ever saw me, nope! Oh well, no reason to worry about that now. “Once these seas calm down I’ll begin to tidy up, it is a mess in here. BTW, sleeping on the floor is not that bad, I got a full hour at one point last night, real good sleep, and I dreamed I was taking a hike with the kids.